Price: $89 (CD-ROM); $79 (download); upgrade, family pack, and other options are available. Requirements: Mac OS X 10.3.9; 10.4 required for full right-to-left text support. Universal. I have a confession to make: my word-processing needs are not that exciting. I have long thought that Microsoft Word’s features, though impressive, were so much more than I would ever need that it was silly to continue paying for it. To come completely clean, most of my writing is done in DEVONthink Pro, where the text engine is essentially the same one provided with Apple’s TextEdit. When I need more, I tend to use a tool more specialized in its function, which accomplishes what I need done. In fact, the introduction of Track Changes in the latest version of Pages removed the last criterion that justified keeping Microsoft Word installed; I simply don’t need it anymore. I suspect that many Mac users are like me, in theory if not in practice. Nevertheless, as a “it meets all of my word-processing needs in one application” product, Word has been the front runner for years. While others have tried, no other word-processing application has come close—yet—to offering Microsoft a run for its money in this category. 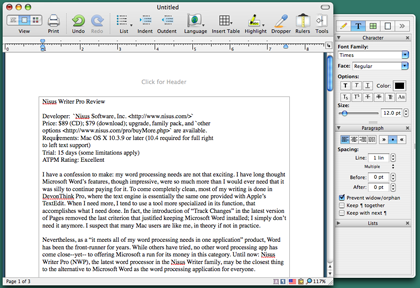 Until now: Nisus Writer Pro (NWP), the latest word processor in the Nisus Writer family, may be the closest thing to the alternative to Microsoft Word as the word-processing application for everyone. Since ATPM’s last review of NWP’s sister application, Nisus Writer Express (NWX), a new version of that application has also been released. While I didn’t look too closely at NWX for this review, it is worth noting that the 3.0 release of NWX followed the release of NWP and benefits from many of the same improvements. I won’t recap the wonderful work that Watts Martin did on the NWX 2 review, but will assume that readers are familiar with that very thorough review. For the record, it was in reading Martin’s review that I realized how truly simple my word-processing needs are: Martin demonstrated in that review familiarity, even intimacy, with features that never occurred to me were useful in a word processor. But maybe a review from the perspective of a usually simple, occasionally more complex user is the one that will help the most users. If so, this review is for you. NWP easily meets all the basic needs for word processing. My list of basic needs includes text formatting, styles, lists, and footnotes/endnotes. All are easily accessible in NWP, through both menus and a great tool drawer (still customizable, as Watts described back in NWX 2.x). And all offer more than just the bare-bones options, instead providing all of the choices any Microsoft Word user might expect (and maybe a few he hasn’t seen). Of course, NWP offers more than this, and the basics in NWP are numerous. Tables, numbering, indention control, table of contents, indexing, and extensive styles and formatting combine into a veritable battery of features. In fact, I can’t think of a design element or option I’ve ever seen in Word or any other straight word processor that isn’t in NWP. Yet the interface isn’t cluttered, the menus are clean and easily navigable, and the drawer is a neatly organized tool. As with NWX, NWP includes a number of features that are impressive and even surprising. 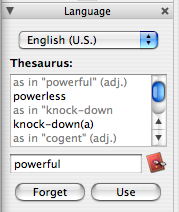 The built-in thesaurus is fast, powerful, and easy to use while writing: one of the tabs in the drawer houses the thesaurus interface, and lingering on a word brings up suggested alternatives. Simply selecting Use applies the chosen synonym in place of the original. Users bemoaning the lack of macro support in the upcoming version of Microsoft Word may want to look more closely at NWP. As Martin mentioned way in his review of NWX, the Nisus word processors are highly scriptable and support extensive macros in Perl and AppleScript, and the new version supports even more advanced macros. 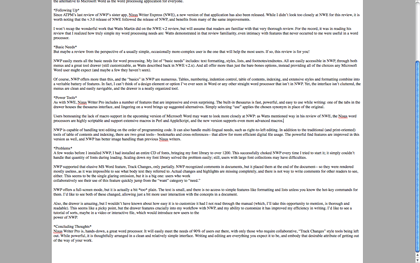 Those of us who don’t write our own macros will appreciate the many macros that come with NWP and will find great help at Nisus’s forum page for Nisus Writer Pro Macros. NWP is capable of handling text editing on the order of programming code. It can also handle multilingual needs, such as right-to-left editing. It supports multiple clipboards and allows you to customize hot keys for every menu command if you wish. In addition to the traditional (and print-oriented) tools of table of contents and indexing, there are two great tools—bookmarks and cross-references—that allow for more efficient digital file usage. The powerful find features are improved in this version as well, and NWP has better image handling than previous Nisus writers. A few weeks before I installed NWP, I had installed an entire CD of fonts, bringing my font library to more than 1,200. This successfully choked NWP every time I tried to start it; it simply couldn’t handle that number of fonts during loading. Scaling down my font library solved the problem easily; still, users with large font collections may have difficulties. NWP offers a full-screen mode, but it is actually a bit too plain. The text is small, and there is no access to simple features such as formatting and lists unless you know the hot-key commands for them. I’d like to see both of these changed, allowing just a bit more user interaction with the concepts in a document. Also, the drawer is amazing, but I wouldn’t have known about how easy it is to customize it had I not read through the manual (which, I’ll take this opportunity to mention, is thorough and readable). This seems like a picky point, but the drawer features crucially into my workflow with NWP, and my ability to customize it has improved my efficiency in writing. I’d like to see a tutorial of sorts, maybe in a video or interactive file, which would introduce new users to the power of NWP. Nisus Writer Pro is, hands down, a great word processor. It will easily meet the needs of 90 percent of users out there, with only those who require collaborative Track Changes-style tools being left out. While powerful, it is thoughtfully arranged in a clean and relatively simple interface. Writing and editing are everything you expect them to be and embody that desirable attribute of getting out of the way of your work. Copyright © 2007 Ed Eubanks, Jr. Reviewing in ATPM is open to anyone. If you’re interested, write to us at reviews@atpm.com. If your word-processing needs are relatively simple (but include endnotes and footnotes) you might want to look into the very fast German program, Papyrus. I have used it, but have yet to find out if it has "track changes"--which I absolutely need. For speed and uncluttered interface it rivals the still unsurpassed WriteNow. Nice review. You mention that some of the options are not easily accessible in full screen view and that the text is too small; however, if you move the mouse cursor to the top of the screen (while in full screen view) and wait for a second, the menu bar will pop up and you can make any changes you need, including a higher text zoom percentage. The bar will fade away as soon as you click anywhere in your document. Lovely review. Your conclusion is spot-on, that Nisus Writer Pro is the perfect word processor for those of us who need power in our text tools but don't want all the clutter and crap of Word's feature-bloat or even Pages' layout tools. One thing this review neglected was the professional and classy support from the Nisus people. They are both personable and utterly helpful. Nisus is a class act, and NWP deserves your accolades. I'm glad Nisus Writer lives on, but still need a few things it used to have (pre-OS X) but hasn't added back yet. Can anyone tell me which apps do have comments that are somehow anchored to the text they refer to? Mario-- thanks for the recommendation. I've heard of Papyrus, but have not tried it. Byron-- great tip! I'm delighted to learn of this. Thanks for contributing it. Ryan-- I appreciate your mentioning that. I haven't had occasion to contact support for NWP, but if your experience is the norm then I do offer them my accolades. Support is a key part of a good product, and you're right to mention it. Cynthia-- Pages (part of Apple's iWork) handles commenting and "tracking changes" admirably. I understand that the OpenOffice variants (both OpenOffice and NeoOffice) offer tracking of changes as well, but I don't have experience with them in that area. Apart from these, I don't know of any non-Microsoft products that support this. Perhaps another reader may suggest one, but if not I think Pages is the best alternative for this particular feature. OOo beats the living pants off of every other word processing program out there. Especially if you work in multi OS environments like I do. There is nothing like having the same program run on OSX Linux and Windows. The aqua native version of OOo is currently in alpha (http://porting.openoffice.org/mac/download/aqua.html) and pretty much works like a charm, though for more critical uses I still default to the x11 port (http://porting.openoffice.org/mac/download/x11.html). The changes tracking in OOo is simple effective and flawless. Another bonus of OpenOffice that is rarely mentioned, but extremely useful is its ability to parse and convert just about every document format that has come along. For someone like me who was heavily invested in older formats from outdated systems (e.g. WordPerfect 5 in Dos, WordPerfect 4.2 in Unix, MS Word 5.1 in both Mac and Windows) the ability to lob just about anything I find on old disks at the program and have usable text pop up is invaluable. And then to have all of this power and usability for free (not to mention a presentation program that's BETTER than PowerPoint) makes me wonder why anyone uses anything other than OpenOffice for word processing jobs. Now for standard text files, there is nothing like emacs... but that's a whole 'nother rant! For what it's worth, the change tracking compatibility with Word is also flawless in Pages. That's one of its strongest features actually. MY need is simply this- people constantly send me files in Microsoft Word, which my Apple with OSX 10.39 can't read. If I wanted to get Microsoft Word for Mac, it apparently would cost me more than the price of a cheap laptop - about $500. I just need to know this - if I download Nisus Writer Pro for $79.99, will I then be able to read all those Microsoft Word files? I also find Nisus Pro a very good alternative to the klutziness of MS Word. The "track changes" problem noted in the review can easily be overcome: just use the "comment" icon on the top toolbar, and the Track Change will appear in the margins. If you want to make it completely compatible with MS Word, just choose the "MS Word" option in the "Save As" tab.